We don't have any trips to Botswana at the moment . A vacation package to Botswana will open up a world of wildlife, landscapes and a friendly culture to all who are lucky enough to explore this vibrant country. Landlocked between Namibia, Zambia, South Africa, and Zimbabwe, Botswana has a fantastically varied terrain including the plains of the arid Kalahari Desert, which covers up to 10% of the country, and the lush wetlands of the Okavango Delta. When traveling to Botswana, visitors will receive a warm welcome from the population, made up of different tribal groups as the country is said to be one of the safest and friendliest in the whole of Africa. Most of the world’s ‘San’ population call the lands of Botswana their home. English is the most widely spoken language of the Batswana, the name given to the people of Botswana, although Setswana is the local tongue. Since the country became independent in 1966, the economy has seen remarkable growth thanks to its abundant natural resources, meaning that Botswana is one of the more wealthy countries in Africa. Almost all escorted tours of Botswana will focus on the vast national parks, some of the richest in the region and considered the most exclusive safari destinations, as Botswana has aimed for quality over quantity when it comes to tourism. 38% of the country is designated national reserve land and animals roam freely without borders or restrictions. Both the Chobe National Park and the Okavango Delta are home to a plethora of wildlife such as lions, crocodiles, cheetahs, hippos, elephants and wild dogs making them the perfect destinations for safari holidays. Aside from the national parks, the Makgadikgadi Salt Pan is another unmissable natural attraction; an impressive landscape of crisp white land and one of the world’s largest. Botswana is also known for its diamond mines, concentrated in the Jwaneng area where the world’s richest diamond mine is located. Many tours of Botswana will begin in either Gaborone, the capital city which is home to most of the population and located in the southeast of the country, or Maun, a once tiny village that now serves as a gateway to the wonderful national parks and safari routes. Visitors will be enchanted by the untouched landscapes that serve to open one's eyes to how abundant nature can be when left to flourish. Botswana has the highest population of elephants in Africa, so nature lovers can enjoy admiring these gentle giants, particularly around the Chobe River area. 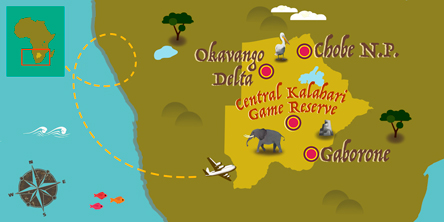 Lovers of adventure can experience 4x4 rides in the Kalahari, canoe trips on the Chobe River and bush walks in the many game reserves. British nationals do not need a visa to enter Botswana for stays of up to 90 days. he PHAC and WHO recommend the following vaccines for Botswana: typhoid, hepatitis A, hepatitis B, cholera, yellow fever, rabies. ATMs are available in the major towns and larger villages, but most only accept Visa. If Botswana has caught your attention, leave us your number so we can call you to discuss the voyage that awaits you.